If you’ve been using text messages for any amount of time at all, chances are you’ve suffered one of the most common side effects of this thoroughly modern form of communication: misunderstandings caused by the lack of emotional context. When you’re talking to someone in person it’s easy to change your inflection or facial expressions, but when texting the words are all there is. A team of engineers at the University of Cambridge and Toshiba’s Cambridge Research Lab have created a high-tech solution to this problem, and its name is Zoe. 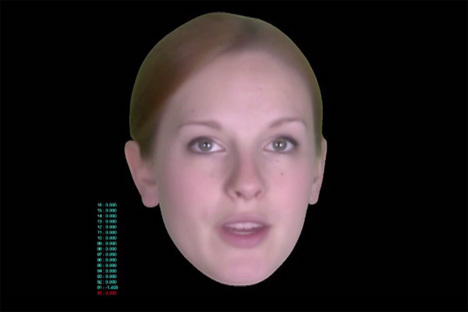 The program uses the face and voice of actress Zoe Lister to express messages in an actual human voice, although future versions could allow you to upload your own voice and face. Although this is what Facetime and Skype are for, the program that runs Zoe would let you send messages silently by typing, allowing for privacy in a public setting. Zoe’s face and voice can express six emotions: happy, sad, tender, angry, afraid and neutral. The message sender can adjust the tone, pitch and speed of the voice to alter the intended meaning. Thanks to the amount of expression possible with the Zoe head, the program isn’t only perfect for communication; it can also be used to help autistic kids read emotions and to help deaf kids read lips. See more in Futuristic or under Technology. March, 2013.